It's getting harder and harder to find dedicated Windows software—it seems like every productivity app lives in the browser these days. That can be frustrating if you're the sort of person who wants to use an app that works well out of the box on Windows as a desktop app. 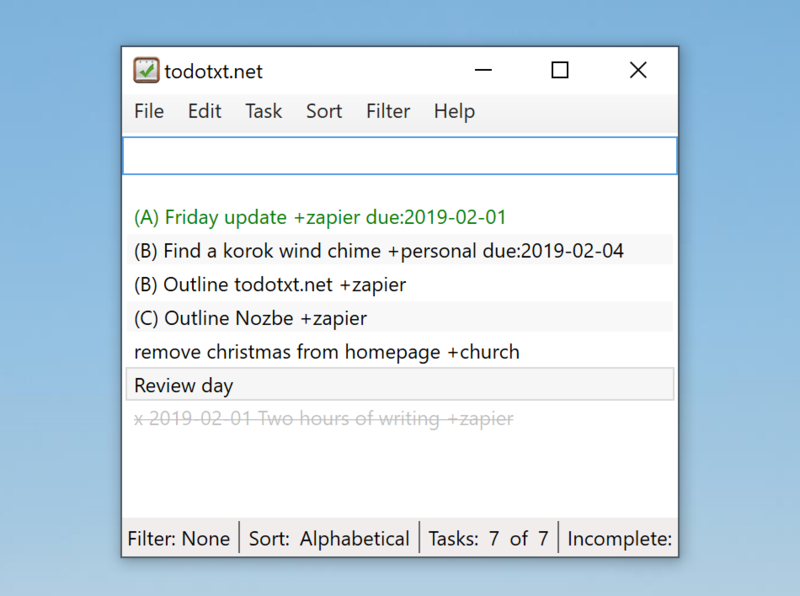 Take to do list apps, for example; most are designed for mobile, the web, or maybe Mac, but few cater to Windows users in particular. Make it fast to add new tasks without opening the app, ideally using a keyboard shortcut. Offer a clean interface, with native Windows features like notifications, live tiles, and Ink. Sync tasks to your phone. With these criteria in mind, here are the best Windows to do list applications. All offer free trials of some sort, so try a few and see what works. Todoist is slowly becoming the most prominent to do list application out there, for several reasons. It's available for basically every platform on earth, for starters. Todoist also offers a nice blend of power user features with a relatively uncluttered interface. Tasks can be organized using projects, due dates, labels, and filters, meaning you'll have all kinds of tools for keeping organized—yet this never quite feels overwhelming. The Windows version builds on that with an interface that feels right at home on modern Windows computers. Native notifications let you know about upcoming deadlines. Users can quickly add new tasks by right-clicking the taskbar icon. You can even pin any list to the start menu, meaning you'll see what's there regularly. All this makes Todoist's Windows version well worth checking out, especially for users who need to sync to Android, iPhone, or even a Mac. Windows doesn't come with an integrated to do application; To-Do is Microsoft's remedy for that. 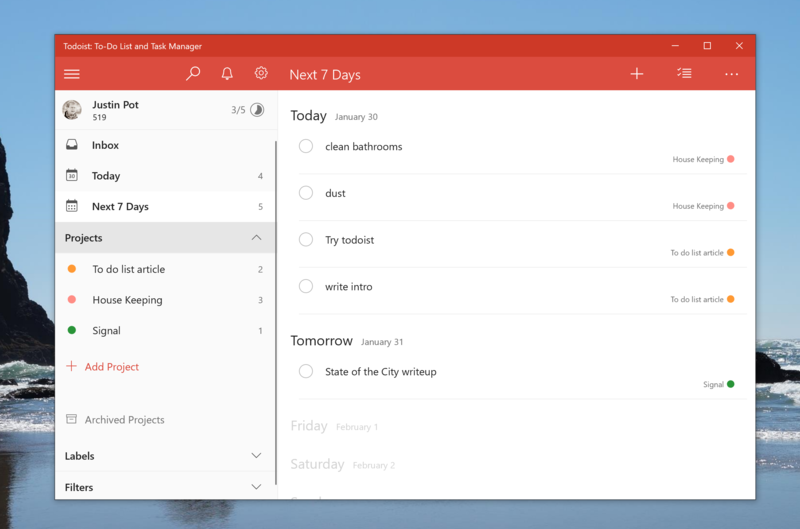 Built largely by the team behind Wunderlist, which Microsoft acquired in 2015, To-Do tries to combine the friendly user interface and powerful features of that application with native Windows features. The user interface is straightforward. You can create lists, complete with custom icons. You can add due dates for tasks, then view your tasks for the day. 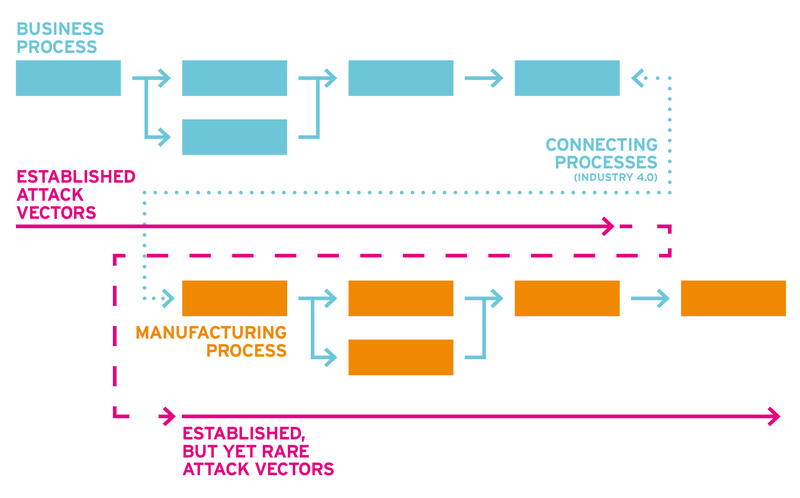 But the real selling points here are the integrations with Windows and Microsoft's ecosystem as a whole. Tasks sync with Outlook, assuming you use the same Microsoft account for each. You can pin individual lists to your start menu, meaning you'll see them throughout the day. You can even ask Cortana to add items to any list, by using your voice or by opening the start menu and typing something like "add milk to my shopping list." Microsoft To-Do pricing: Free for Windows, Android, and iPhone/iPad. TickTick is somewhat of a dark horse in the to do list world, granted, but it's well worth a look. This powerful yet elegant application is cross platform, yes, but it also makes an effort to blend in on every operating system it's offered for. The Windows version of TickTick is particularly nice in this regard: this user interface feels right at home in Windows 10. You can quickly add a task, no matter which program you're using, thanks to a system-wide keyboard shortcut. 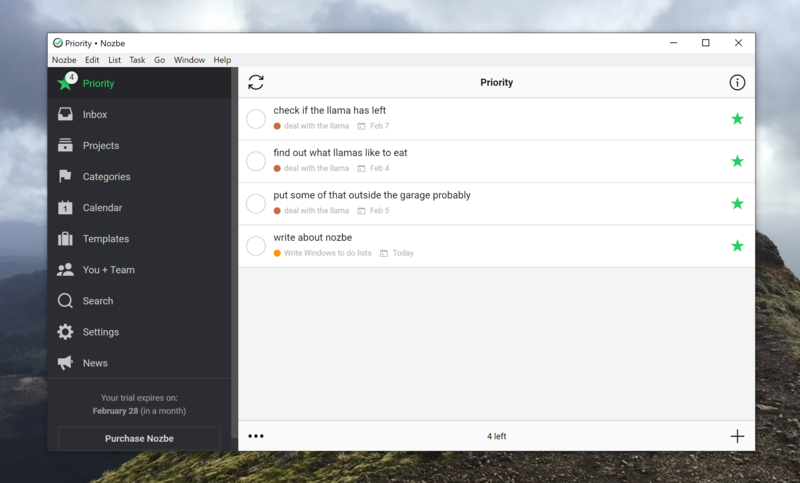 There are optional widgets, allowing you to see your task list or your calendar on your desktop. There's even a tray icon, meaning all functionality keeps working even if you close the main window. None of this would matter if TickTick didn't offer the kinds of features we look for in a to do list. Happily, TickTick delivers. There are various ways to organize your tasks including projects, due dates, and sub tasks. There's also optional integration with third-party calendars, including Google and Outlook, meaning you can see your tasks and your appointments in the same place. All of this means TickTick is well worth a spin for Windows users, even if the native software lives behind a paywall. 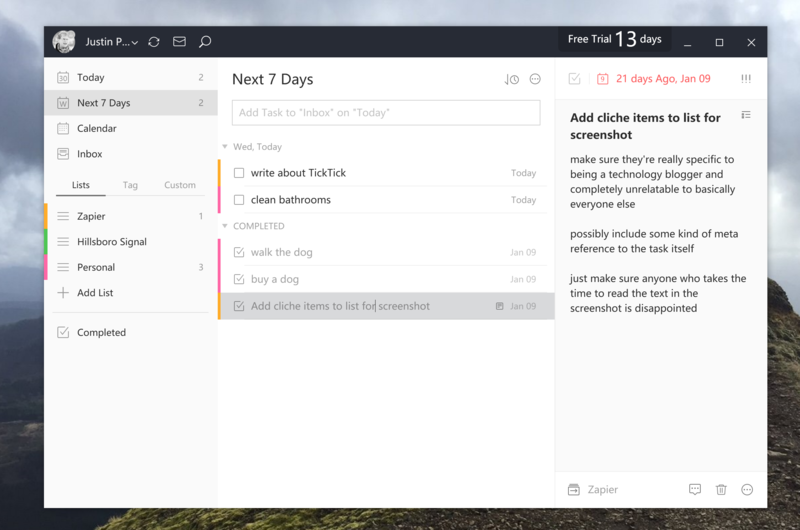 TickTick for Windows price: TickTick is free but the Windows application is only offered to Premium users after a 15-day trial. Subscriptions start at $2.40 a month. Microsoft Outlook isn't primarily a to do list application: email, calendar, and contacts are all emphasized more in the user interface. To even find the task list feature in Outlook requires some digging. And yet it's hard to leave Outlook off a list like this. For one thing, nearly three decades of history means Outlook is integrated into a many a Windows user's workflow. For another, Outlook is the best way to access tasks synced using Microsoft Exchange, and Exchange servers remain common in the corporate world. 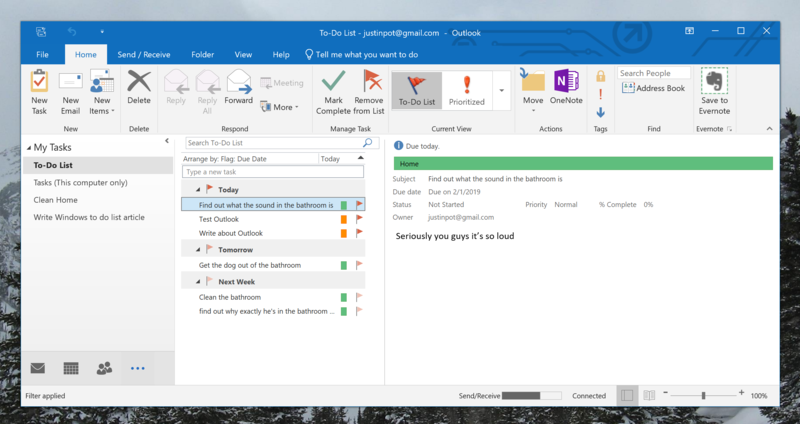 Outlook's task functionality, once you find it, isn't exactly clean and uncluttered like the other apps on this list, but it is highly functional. Users can organize tasks in folders, by due date, or using priority levels. Tasks are also integrated with your email, meaning you can quickly do things like turn an email into a task or forward a task to a colleague. One downside, and it's a big one, is syncing to mobile. Put simply this isn't directly possible; the version of Outlook for mobile doesn't support tasks. 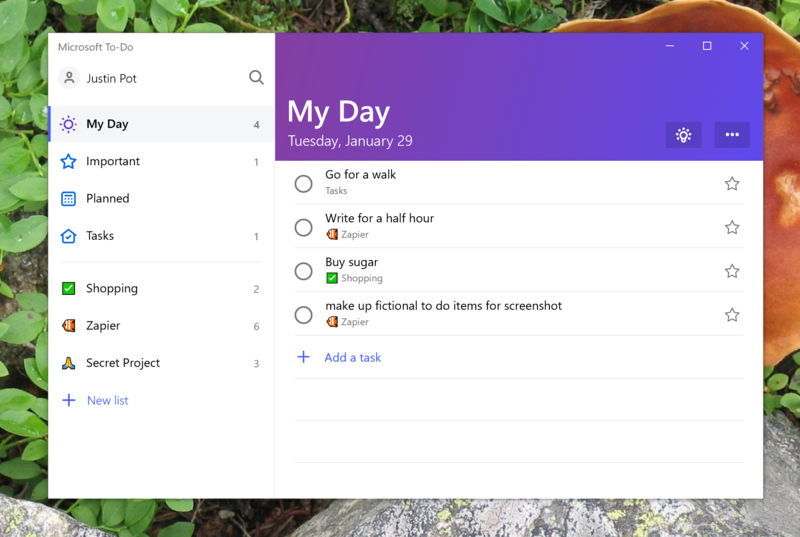 Microsoft To-Do, mentioned above, can sync with your Outlook tasks, and it offers version for Android and iPhone, so that's a potential workaround. Microsoft Outlook price: Outlook comes as part of Microsoft Office, which starts at $8.25 as part of Office 365 or $249.99 as a one time purchase. 2Day was built, from the ground up, to be a modern Windows to do application. That alone makes it unique on this list, but 2Day is also perhaps the most powerful GTD application available to Windows users. There's a wide variety of ways to sort your tasks: by folder, due date, tags, priority, or even custom smart lists. There are also subtasks, progress tracking, and so much more. And everything fits nicely into existing Windows workflows. A quick add feature, found by right-clicking the taskbar icon, makes it fast to add new tasks whenever you think of something. An optional dark mode helps 2Day blend with the rest of your operating system. And you can even pin entire task lists to your start menu, giving you a quick way to view them regularly. There's no mobile version of 2Day, sadly, but you can sync your tasks using various Microsoft services or ToodleDo. So what's the downside? This application is no longer maintained by developer Jeremy Alles, who was hired by Microsoft to work on Microsoft To-Do (are you seeing a pattern here?). 2Day is now an open source application; Hopefully a community picks up where the Alles left off. Looking for a full-featured GTD system that syncs with other platforms? Nozbe is well worth a look. This web application offers all kinds of advanced features. Tasks can be organized into projects, and there are even templates for projects—useful if you tend to do similar projects with some frequency. You can also organize tasks by due date, tags, priority, and categories, and a range of collaboration features make it easy to coordinate with a team. The Windows version of Nozbe offers a quick add feature, triggered with a global keyboard shortcut, allowing you to add tasks regardless of which application you're currently using. Hashtag support in this mode means you can quickly add things like due dates, projects, and more. There's also a tray icon, which gives you quick access to the priority, calendar, and comments view. Give this application a shot if the others aren't offering you quite enough power and configurability. To do lists do not need to be complicated—plenty of people use a pen and paper for the job, after all. It's this mindset that led Lifehacker founder Gina Trapani to create todo.txt, a system for managing tasks in a single text document. There's a command prompt application for this system, which you can install in Windows, but todotxt.net offers a graphical user interface for the same standard. Keyboard shortcuts make it quick to add and organize your tasks, while custom filters give you a variety of different views. There are also quick tools for adding things like due dates, which would otherwise require you to manually type them in. This will all take a little setting up, sure, but it's among the most customizable options out there once you put in the work. Syncing to mobile is up to you; many users combine Dropbox with an application like SimpleTask on Android or todo.txt for iPhone and iPad. 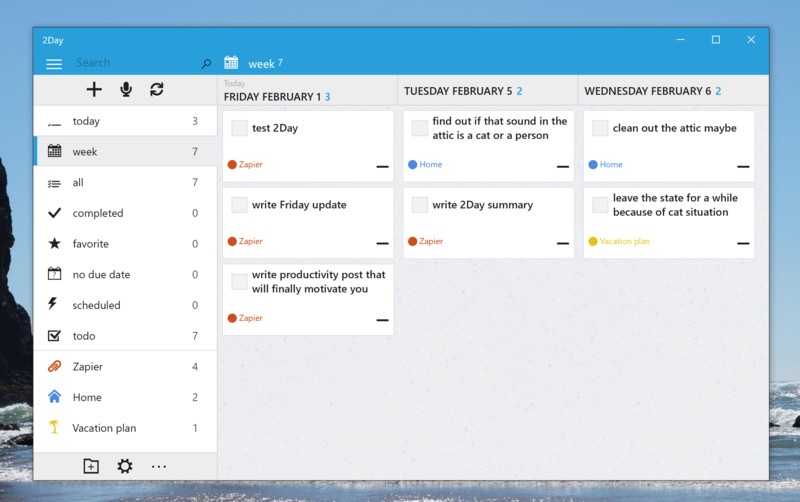 Trello isn't a to do list per se but you can use it to organize your life and there's a Windows app. Microsoft Sticky Notes isn't a to do list either, sure, but it can work as one in a pinch. Recent versions can even sync between PCs. Evernote, OneNote, or any other note taking application can work very well as a to do list, and most offer a Windows app. Wunderlist used to be a no-brainer for lists like this, and is still quite nice. The problem: Microsoft bought Wunderlist and is shutting it down at an undetermined point in the future, making it hard to recommend. The intended replacement, Microsoft To-Do, is outlined above. It offers migration tools, so you could use Wunderlist for now and migrate when necessary. Cortana supports reminders, which can come in handy: just ask Cortana to remind you about something. Microsoft To-Do's integration with Cortana is probably a better bet for most users, though.